I get a lot of my t-shirts from H&M. H&M, if you're not fortunate enough to have one near you, is a Swedish store of cheap and trendy clothing. Those clever Swedes, with their Ikeas and their H&Ms! You can get nice t-shirts for under $10 in a variety of colors and styles and so I have a lot of them. My old job was catty-corner to an H&M, which meant I went there way more than necessary (especially during fire drills). Luckily, my new job is in an eating-out-and-retail wasteland, so I'm not tempted to spend money during the week. Also, I earn half as much *and* I don't hate my job and therefore need retail therapy. But my old H&M t-shirts are still going strong, heartily sick of them though I may be. One of them that is no longer going strong is this green one, which I loved when I bought and promptly ruined the first time I washed it when I threw in a tote bag, the handles of which bled dark blue all over it. Boo. It's perfect for a small bust, as the gathers are enough to give the illusion of a bust without being so large as to create sagging and bagging where a bust should be. As I mentioned in my post on cleaning, I use old t-shirts as rags. They are a good size, absorbent, and reuseable. No point in throwing them away and then using something else that will be thrown away to clean! So, into the rag pile it went. When I was doing my big clean for the inspector/appraiser, I was using this shirt as a rag at one point and thinking, "*sigh* This is such a good shirt. Too bad stock turns over within weeks at H&M and it is years out of the store. I wish I could get more...." And then I realized that duh, I have the skills to get more. I can't believe it took me so long to realize it! Like two years! Anyway, once the cleaning was done I took it apart, made a pattern, and replicated it. I'm thrilled! I suspect I will be using this pattern for years to come. You can see the process pictorially and read the PR review for more details. Cidell came to visit this weekend so we could take lots of measurements. She has this crazy idea in her head that we are going to start fitting our patterns! Like I said, crazy. 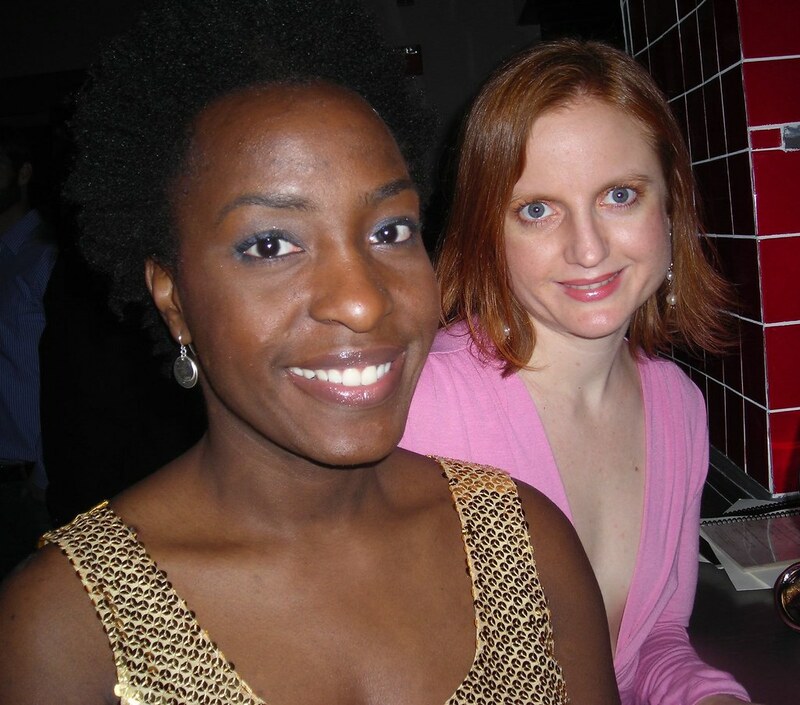 She came down on Saturday night and we got all pretty and went out. Knowing that we would need sustenance in the morning before a long day of measuring, I made a quiche the night before to have in the fridge. 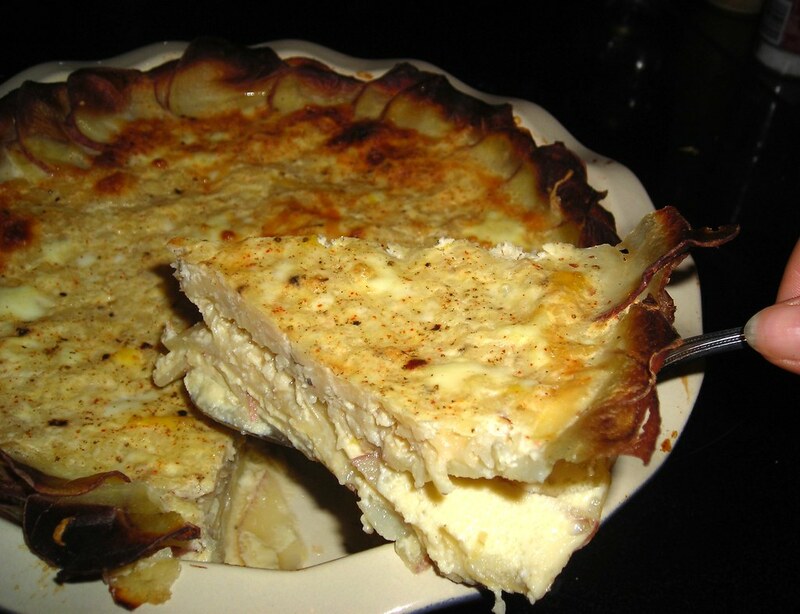 I don't like pie crust and I find it tiresome to make, so taking a cue from the Spanish tortilla (a cold omelette like item with potatoes in it, not the Mexican flatbread tortilla) I use potatoes instead. Once you try it you won't go back. Quiche is an easy (though not quite quick because of the long cooking time) dish for a satisfying brunch, and you can make it in almost infinite variations. Here's one of them. 1. 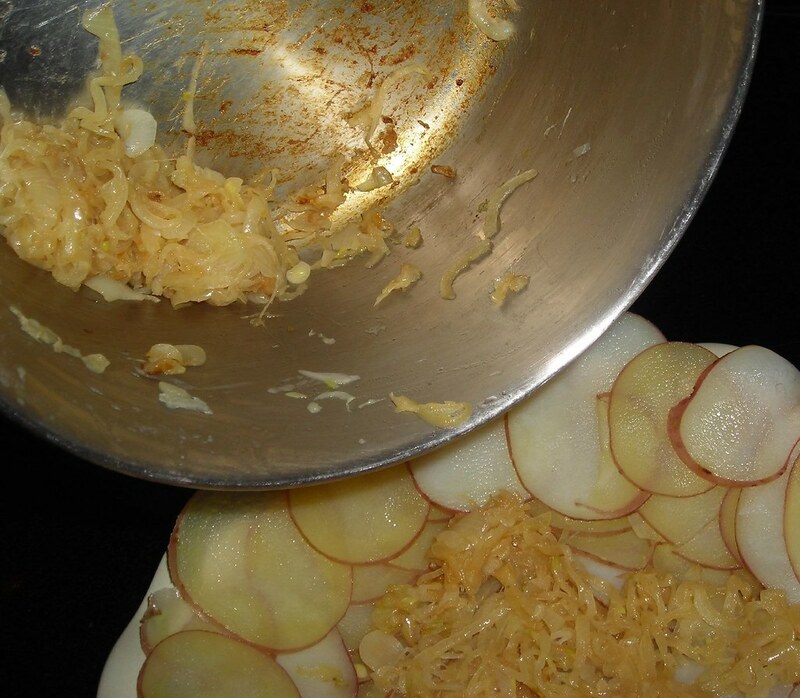 Slice the potatoes very thinly, about 1/8 inch. I use my mandoline for this. No need to peel. Place in cold water on the stove and when it comes to a boil set the timer for four minutes. This will parboil the potatoes to make sure they are not crunchy when the quiche comes out of the oven. Drain. 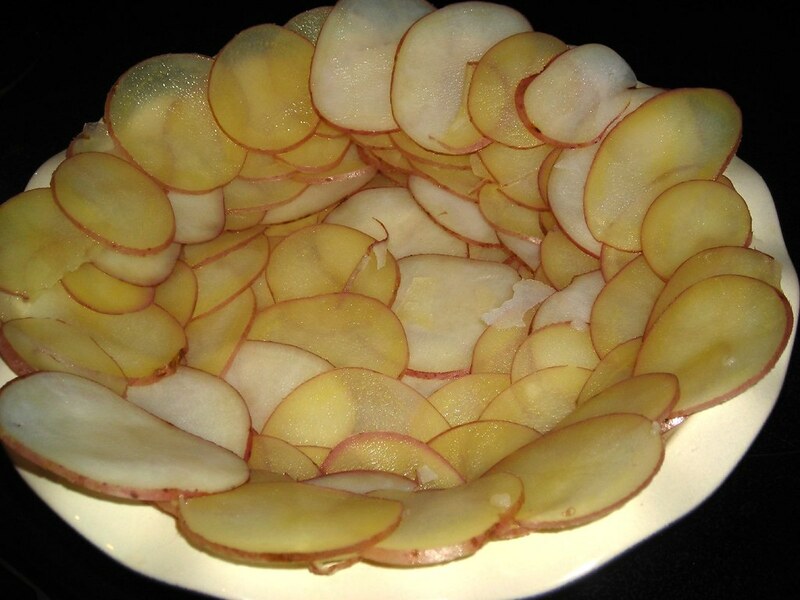 When cool enough to handle, oil your pie pan and layer the potato slices to form a crust. 2. Thinly slice an onion. I used the 1/4" setting on my mandoline for this. Heat a pan over medium heat and when heated pour in some olive oil and add the onion. Saute until it turns golden almost to brown. Spread the caramelized onions over the potato crust. 3. 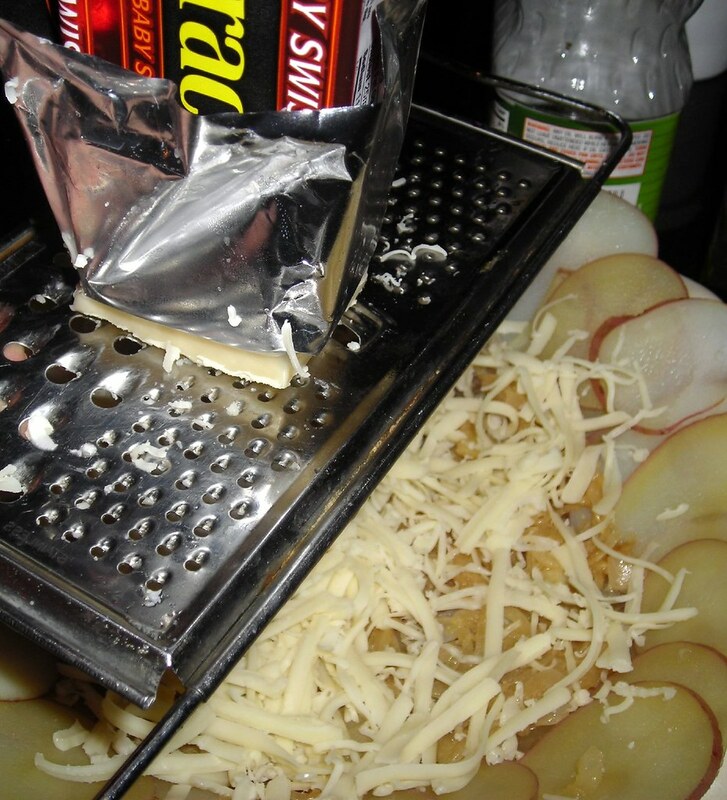 Grate cheese over the onions. 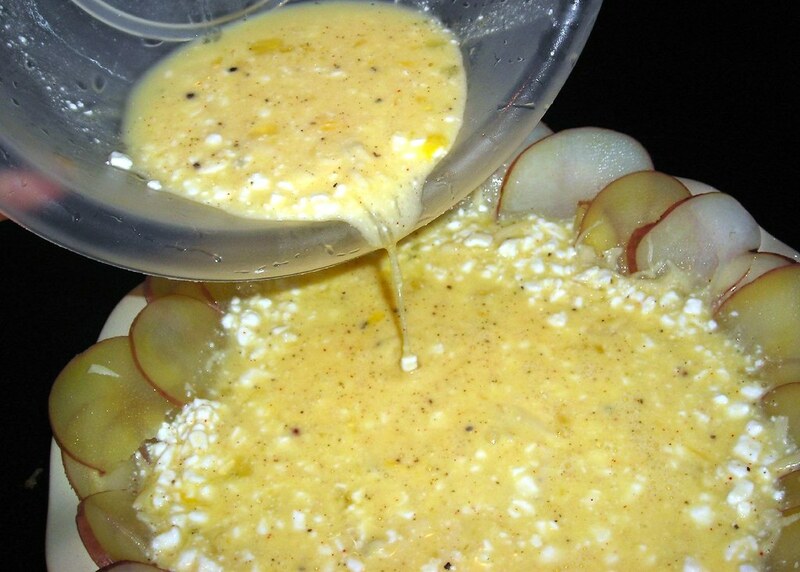 I like to use Swiss cheese because it has a strong flavor that stands up to the other ingredients. 4. Mix up the filling. 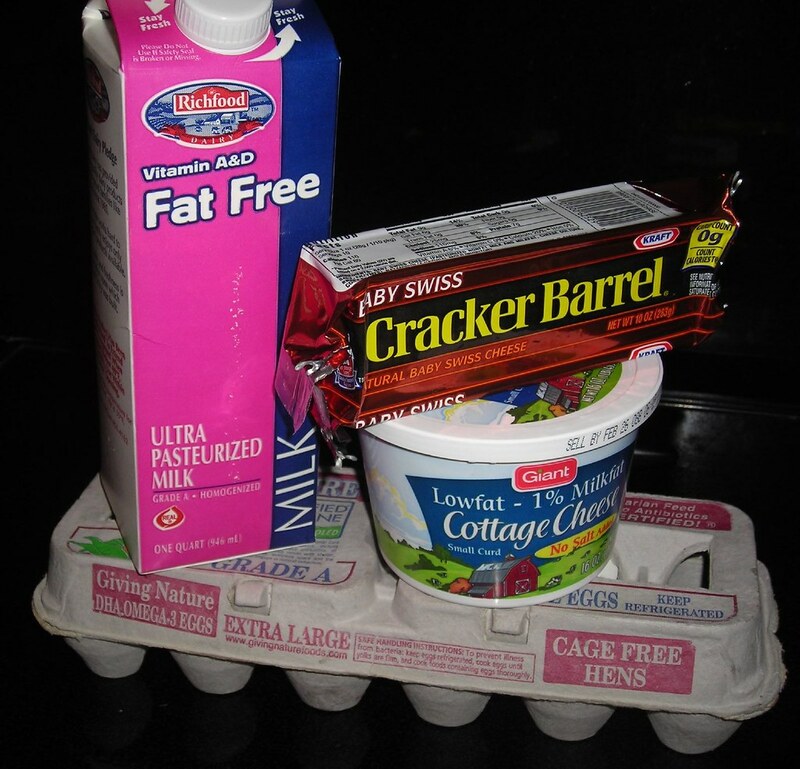 For this 9 inch pie I used 3 eggs plus the white of an egg I had leftover from another recipe, about half the container of cottage cheese (1 cup), and about half a cup of milk. There's really no need to measure, just make it liquid but not soupy. Use herbs and spices to your liking. For this one I used thyme, ground bay leaf (it's Badia brand from the Hispanic foods section), salt, pepper, and cayenne pepper. I normally wouldn't add salt, but I accidentally bought no-salt-added cottage cheese. If I had made spinach quiche, I would have used basil and oregano. Mushroom would have been thyme and sage. Pour the filling over the crust, onions, and cheese. Don't get too ambitious in how much filling you make, because it will puff up during cooking and could overrun the pan if you've filled it to the very top. 5. Bake at 350 for 40-50 minutes, until it is firm in the center and the top is beginning to brown. 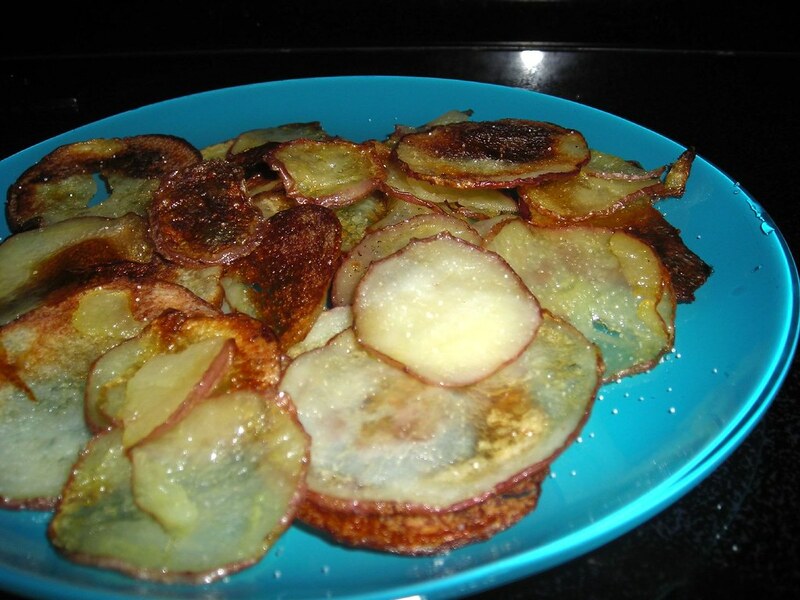 The outer potatoes will be very dark and crispy (but not burnt). If you had any potato rounds leftover, toss them in olive oil, place on a baking sheet in a single layer, sprinkle with salt, and throw them in the oven with the quiche for some oven potato chips. And you have a quiche! Serve warm, tepid, or cold. I prefer warm, but I don't like cold foods. I made this the night before and refrigerated when it was cooled. To serve, I cut two slices, grated a little extra cheese over the top, and heated in a 200 degree (Farenheit) toaster oven until warm. Yum! Going into 2007, my fabric buying was pretty out of control. Though I had barely touched my sewing machine in the two years I was in private practice, I dutifully continued to acquire fabric as that was the only connection I had with sewing. When I switched to my current job, I started doing a lot more sewing but my buying was certainly outpacing my sewing. So last year was the year of Curbing My Fabric-Buying Enthusiasm, and I set periods of 2-3 months during which I was not allowed to buy fabric. This worked well. I was good about not breaking my periodic fasts, and the open-season periods were short enough that I didn't do too much harm. In reorganizing my sewing room, I found that my stash is not as out of control as it felt when it was a huge mess (not surprising when you think about it). So I don't have to be on a complete fast, but my buying needs to be very modest and scaled down. I am still working on the parameters. Maybe it will be every other month? Or maybe it will be based on yards sewn? I still haven't quite worked it out, but I have decided that I will have to confess all purchases here. Hopefully this will prevent me from buying cheap, yucky fabric I will eventually discard just to get a fix. At any rate, I hadn't bought any fabric yet in 2008 when I went to Fashion Sewing Club at G Street Fabrics last Saturday. Fashion Sewing Club is fun--there's a core group of about six of us (out of whom I am the youngest by around 20 years) and Ms. Marzella from the notions department puts together a little presentation and we talk about buttons or dresses or belts or bags or whatever the topic of the day is for half an hour and then do show and tell for half an hour. It's really fun to see people in person to talk about sewing. Fashion Sewing Club is free to attend, and if that's not enough there are added incentives. Everyone gets a coupon for 15% off your entire purchase for the day, and there is a drawing for a gift certificate. I never win the drawing. In the two years I've been going to Fashion Sewing Club I've won once. I decided this time that if I won it was a sign I could get some fabric for a red, white, and blue wardrobe I've been planning. Amazingly, I won! In the past, the gift certificate has been $15, but I guess times are tough and it was only $10 this time (I'm not complaining). So I ended up paying $5 for my six yards of fabric from the $2.97 bargain table but I think that's OK. I'm going to call it two yards purchased, since that was my cash outlay--my restraint was always more about not investing jaw-dropping sums of money in long-delayed sewing than not having enough space, so free stuff doesn't go in the tally. 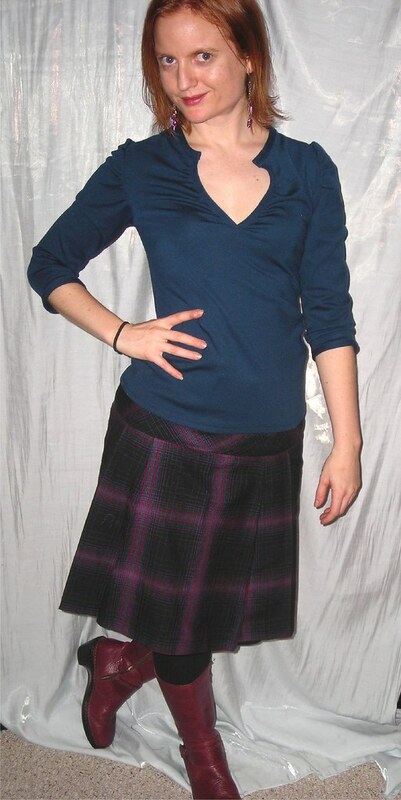 The dark is one is actually a deep navy, not black, and I believe it is a rayon/poly/lycra with a subtle self-striping. It will be used for a sailor-dress version of Vogue 8408. 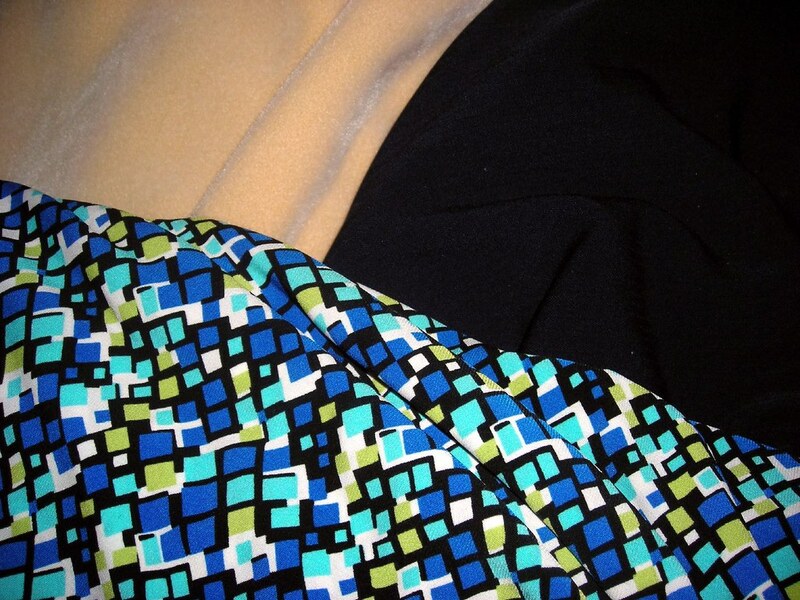 The print knit will be Vogue 8379, the DVF-like wrap dress. Of course, *when* these projects will actually occur is always a big question, but I have no compunction in sharing these purchases with the world. I loved the purple version of BWOF 8/06 #113 so much that I knew I'd be making another one shortly. Early in the Fall, I became obsessed with the idea of making a sweaterdress. I was picturing something comfy-cosy and still pretty. It's hard to find sweaterknit fabric, actually, and I ordered some cotton double knit from Wazoodle hoping it would suffice. Please note: double knit looks nothing like sweaterknit, and when one is ordering a particularly bright shade of green one should not order five yards of it. Needless to say, it did not suffice. Then I found some on FFC, an off-white with a few metallic gold threads running through it--very pretty, very feminine. Yay! I thought this pattern would be a great fit as a sweaterdress. In the magazine it was suggested to use jersey or sweaterknit, and people have made very successful versions out of sweaterknit in the past. Yay! So, um, let's review: white sweaterknit + tie = bathrobe. I cut it off and made it into a shirt. It still looks a leeeetle bit like the oversized love child of a karate uniform and the clothing worn by the rebel alliance in the first Star Wars trilogy, but I also think it's kind of cool. 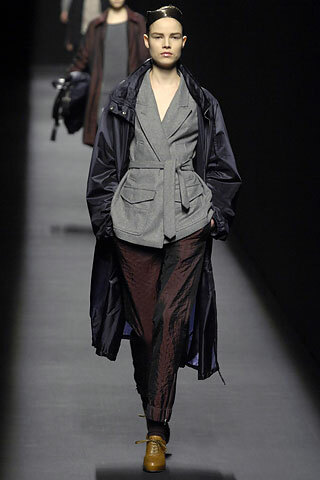 I'm citing my style influence as Dries Van Noten--check out his oversized, belted sweater with large collar from Fall 2008. And this sucker is warm! As part of sewing with stash, I underlined it with some white ribbed cotton (part of the reason it looked so bathrobe bulky, but I don't think a thinner underlining would have solved my problem) so it's perfect for those cold winter days when, well, you *do* want to wear your bathrobe around all day. I hate winter. Let's start with the basics: I hate being cold. I am a second generation Angeleno. My parents were both born in Los Angeles. I was born in Los Angeles. I lived in semi-tropical Southern California until I was in high school, at which point my parents moved to Texas. To us, Texas was crazy with the seasons. Leaves fell from trees! There were biannual flurries! The humanity! I didn't like the Texan winter, but I could live with it. I went to undergrad in Louisiana where, other than a freak giant snowstorm my sophomore year, the weather was as temperate as it had been in Texas. In the South, predictions of temperatures below freezing cause rioting in the streets, or at least in the bread/toilet paper/milk aisles of the grocery stores. As an aside, what is up with buying toilet paper when it's cold? Maybe people fear it will make them pee more? Then I moved to Washington DC. There is no way I will ever go further north than here. It gets cold here. Below freezing on a semi-regular basis. Snow that sticks on occasion. The horror. So, hating cold is the basics, but that is not where my hatred for winter ends. I HATE the clothes. I hate wearing pants. I hate bundling up so I feel like an abominable snowperson rather than a girl. I hate wearing pants. I hate having to wear long underwear under the pants I hate wearing. The clothes are so boring they make me want to die. Until now, I've pretty much sewn nothing for cold weather. Instead, I am the opposite of the grasshopper who sings all summer. I spend all winter stocking up on flirty skirts and floaty dresses and anything fresh and floral you can imagine. And every day I die a little bit when I put on PANTS and some boringboringboring 3/4 sleeve V-neck t-shirt from H&M (I own this t-shirt in approximately six colors, and the scoop neck tee in about 4). I still fear and loathe pants too much to attempt them--though there is a side zip pair of petites in the 8/07 (as I recall) issue of BWOF that I will make eventually--but I decided it was time to take matters into my own hands with regards to the boringboringboring shirts that make me want to vomit when I look at them. Thus was born Two Weeks of Winter Work Tops. I have been working toward this goal pretty well until now. Now I want to make dresses and fresh little springy short-sleeved blouses. So I will go public with my project in the hope that peer pressure will keep me on task. The goal is five woven blouses and five knit tops. Theoretically, these pieces should be able to be worn in a two week rotation for a couple of months without (1) me getting sick of them, and (2) my co-workers noticing that I'm wearing the same thing over and over. But the thing is, I hate sewing basics! If I'm gonna sew, it's gonna be awesomely distinctively cool (at least in the legend-in-my-own-mind sense). I always say, "pshaw, I can buy the basics for cheap at H&M or Target. Why waste my time?" But the thing is, because of my bust, I can't. I have a bra by Playtex from their "Thank Goodness It Fits" line. The cup size is called "Nearly A." Really, my cup size is more like, "Nearly Imperceptible." Finding a woven blouse that doesn't look like I'm dressing up in mommy's clothes is a rare occasion. Knit tops are slightly better to fit, but I am very particular about style (interesting but not crazy; no prints; no logos; no words). So I do need to sew these basics. OK fine, my basics are never going to be *that* basic. I don't know that I'll find substitutes for the "Too Distinctive" items, but I suppose I'll make a half-hearted effort to do so. I'm so close! Just two woven blouses left (though I have at least one more planned after that), and though I have technically reached my goal on knit tops the maroon gather-neck tee needs to just get done already. So for this weekend chant it with me: Two Weeks of Winter Work Tops! Two Weeks of Winter Work Tops! Two Weeks of Winter Work Tops! Step awaaaaay from the delicate blouses of Spring and in the direction of Two Weeks of Winter Work Tops! I have no qualifications whatsoever to offer advice on cleaning to anyone (see the part where I'm a total slob). On the other hand, when I do clean it is a serious, major, Spring-Cleaning type clean so I know something about stamina. This was a three day weekend of cleaning. The house is beautiful (for about three seconds), and I am comfortable with the level of judging my current state of housekeeping will elicit from the appraiser guy (I keep wanting to say "inspector"--you can see how I feel about someone coming in my house and poking around!). None of what I have to say is, like, new and revolutionary or anything but that never kept me from opening my trap. First, the best thing I ever did for my cleaning self: go to the sporting goods store and buy a pair of good kneepads. Seriously. This had a big impact on my willingness to do hideous things like clean baseboards and scrub floors. Kneeling on a towel just is not enough cushion. When I'm cleaning I just strap them on for the duration and then it's so much more comfortable to get up and down and crawl around. When you go to the sporting goods store, don't make the same mistake I did, however. I found the generic kneepads, which came in S-M-L-XL. I resourcefully used a lacrosse stick to grab myself a pair of smalls, which were "conveniently" located way at the top--as those of us who are small are usually also...tall? Anyway, when I got home I realized that those were not adult sizes, those were ALL the sizes and I had gotten kneepads for a tiny child. Since I am a resourceful sewist, I cut the back stretchy bit up the center and added several inches of black spandex so they fit me. But it would have been easier to get the right size in the first place. Second, when I read one of Augusten Burroughs's books he had all these stories about his insane cleaning lady. One of her insanities was to clean windows and mirrors with newspaper. She insisted that this was best because newspaper leaves behind no lint. I figured, eh, I'd try it but totally didn't think it would work. Newspapers might have no lint, but they do have a lot of smudgy gray ink that grimes up your fingertips and ruins your clothes. But lo and behold, newspapers do an *excellent* job of cleaning windows and mirrors when combined with windex type spray. Somehow they just work. Third, save your old cotton t-shirts (or other cotton jersey/knits) for rags. Rags are so much better than sponges (more surface area, less ick factor) and so much better for the earth than paper towels. Get 'em dirty, wash 'em in hot, and they're good to go again. I thought I had way too many rags until I did the whole house cleanup thing, when I actually had to wash a load in the middle! Major convert to rags here. 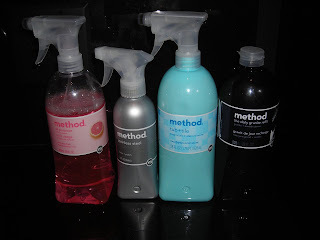 Finally, I'm a big fan of the Method cleaning products from Target. They are non-toxic, smell good, and clean really well. Grapefruit flavored all purpose cleaner. This was the best product for removing (ahem) three and a half years of hard water stains/soap scum from my glass shower door. There was more elbow grease than cleaning product involved for sure, but it worked more effectively than ammonia, vinegar, or tub and tile cleaner. Stainless steel cleaner. I have those oh-so-popular stainless steel appliances, and they are really hard to keep shiny. This stuff works better than any other products I tried, though not perfect. I also highly recommend the SimpleHuman Microfiber Stainless Steel Cleaning Mitt (OK that's not its official name but I can't remember its official name; I got it at Bed, Bath, and Beyond), or I'm sure any piece of microfiber will do. The mitt is actually better on its own than most of the chemical cleaners out there. Tub and Tile Cleaner. I also use this on the toilet. Daily Granite granite cleaner. I keep a small spraybottle of this on the kitchen counter at all times. My countertops looks good and don't appear to be harmed. Off to enjoy my beautiful home. Happy cleaning to you. Let me start by saying that I am not a religious person, nor am I one of those who is "spiritual but not religious." This does not mean I have no moral compass. I try to live my life by the Golden Rule, and hope that others do the same by me. But beyond that...I don't believe in much. But sometimes, karma is just amazing. On Thursday one of my neighbors asked me to create a jewelry set to donate to the silent auction at the annual Georgetown Pediatrics Gala. 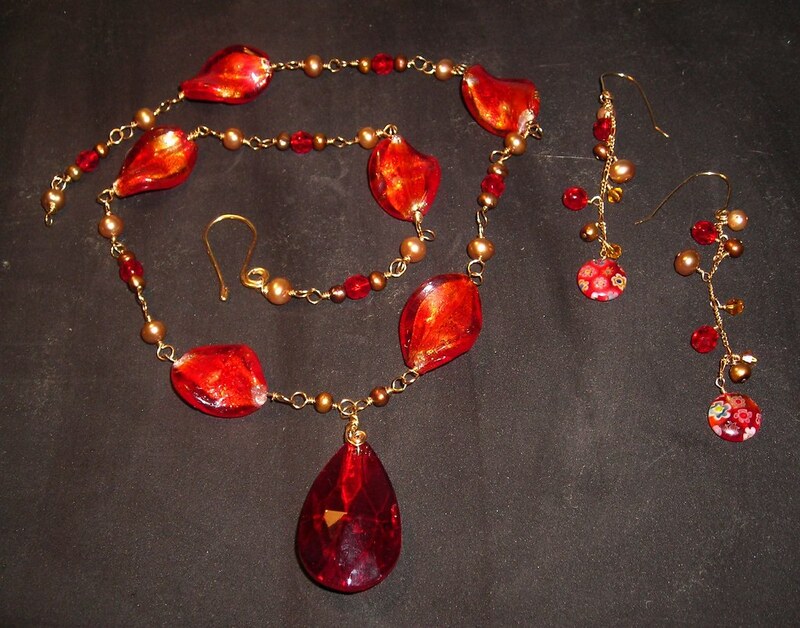 While sewing is and always has been my first love, I got into jewelrymaking after I graduated from law school. Suddenly, for the first time in my life I was living alone and not in school and I just had no idea what to do with my evening time! Then (as now) I found it too difficult to sew during the week because I felt like I couldn't get anything done in the few hours of a weekday evening. I spent a lot of time at the gym. But when I got home after that, sitting around watching TV got real old, real quick. So I bought some beads. I loved them. Stringing went by too quickly and I didn't feel like I could be creative enough, so I learned to do some wirework and was very content. This hobby kept me company during a lot of hours! I am definitely back more into sewing recently and haven't done much jewelry lately. A couple years after 9/11 they relaxed to rules on what you can carry onto a plane so now I can bring my pliers with me onboard and I do most of the jewelry stuff I do while traveling. My neighbor knows I make jewelry because she commissioned a piece from me. It was a blast to make. 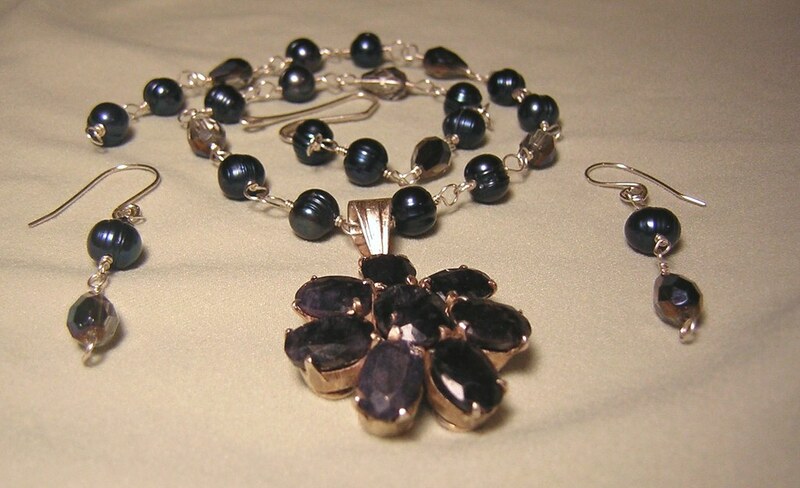 Normally I make jewelry that suits me, but we have completely different styles. For her I got to make a big, substantial, chunky, ethnic piece that I totally loved but never would have made in a million years otherwise. So for the gala I decided to make a piece on a much larger scale than I would normally do. The pendant is about an inch and a half long, and the twist beads are about an inch long. I think this piece will be great on a dramatic grown up woman over a black turtleneck or boatneck tee. I hope somebody wants it! So here's where the karma comes in. I made this yesterday (my off day) while I was supposed to be cleaning the house (more on that later). This morning I checked my email...and I had an order from my Etsy shop. Etsy is a great venue, very easy to set up and the fees are relatively low. So I set up a shop a while back but since I've been in a sewing fever for so long it's been months since I put up anything new, and even longer since I made a sale. This was completely out of the blue. Literally just hours after I finished the donated set. Wow! I was really humbled by that. It's going to look great on her. Blue-grays are definitely her color. Thank you again, Lisette! The other thing isn't nearly as cool, but you know how the Great Craft Clean Up of 2008 wasn't really prompted by anything in particular? I just felt like it was time? Well, I am refinancing at the moment because when I bought my condo the builder's lender offered a deal where it would pay the closing costs if we used them. Their rates were as good as any, but the best product they were offering was a 5 year ARM. I took it, figuring I could refinance later when I had 20% equity without any loss since I'd just be paying the closing costs I would have paid before. When the Fed cut the rates in advance of their meeting a couple of weeks ago, a 5.25% mortgage was available for about 4 hours and I managed to lock it in. The appraisal is scheduled for Tuesday, and this particular broker uses a guy who actually comes to your house to check it out. *blanch* But it is such a miracle that I cleaned out the craft room already! I can get the rest of the place (closets included!!!! Geez, I feel like this guy is giving me the white glove inspection) into shape in a weekend, but if the craft room was in its old state I would have been toast. Strange but cool.